Back pain can literally stop you in your tracks. It can keep you from being as active as you like to be, perhaps keeping you from normal daily activities or even hindering your ability to work. Back pain can be brought on for a multitude of reasons including heavy lifting, an accident, or even arthritis. Most people are naturally inclined to reach for a pain reliever in the form of a pill to help alleviate any back pain symptoms. If you find yourself being tired of relying on medicine as a pain reliever for your back pain, or if medication doesn’t seem to help to get you back to feeling like yourself, a visit to the St Paul office of Caron Chiropractic Clinic, P.A. might be just what you need! Any medication you put into your body will have an effect, some can be positive, some can be negative. Caron Chiropractic Clinic, P.A. offers you an alternative to pill form pain relievers. While chiropractic care is certainly the foundation of our practice, we know that melding the chiropractic piece with other natural therapies such as massage and acupuncture can be beneficial. We want to offer you the ultimate in care! Chiropractic care is certainly the foundation of our practice, but we know that other natural therapies can have benefits as well. We use spinal adjustments to help relieve pain, and many times our patients have immediate results. If you are hesitant about having a spinal adjustment, we want to assure you that it will not and should not be painful. If you are suffering from back pain, chiropractic care is often times the most effective treatment. Some people might be hesitant to try acupuncture because it involves needles, but as a treatment that has been used for over 4,000 years there are clearly many benefits. In the St Paul office, Dr. Graff combines the use of chiropractic care with acupuncture to provide ultimate care for your pain. With acupuncture, he is able to target the specific problem and help your body to heal without medication. There is no denying that medicine can help relieve pain, but now many people are wary of long term effects of taking medicine. Caron Chiropractic Clinic, P.A. offers you a wonderful alternative to a pill bottle. 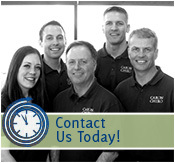 Call us today at (651) 255-9999 today to schedule an appointment! This entry was posted	on Friday, October 30th, 2015 at 6:06 pm	and is filed under Acupuncture, Back Pain, Chiropractic Treatments, Massage Therapy. You can follow any responses to this entry through the RSS 2.0 feed. You can leave a response, or trackback from your own site.